This unique little leatherette trim dress is something you don’t see every day. The Leatherette Trim Pleated Chiffon Dress comes in two great colors. It is fully lined and made of pleated chiffon fabric. The standout feature of this dress is the brown leatherette that trims the neckline and makes up the straps of this dress, forming a buckle closure in the back. An included leather sash wraps around the waist and can be tied off to one side. The Leatherette Trim Pleated Chiffon Dress would look great paired with brown flat sandals—or dress it up with brown pumps or heels. 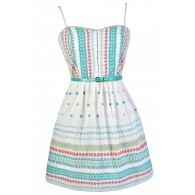 Another option is to pair this fun dress with brown cowboy boots for a country-inspired look. Also available in White. Details: Fully lined. 100% polyester. All man-made vegan friendly materials. Hand wash cold with like colors. Do not bleach. Hang to dry. Small measurements: Length from top of shoulder strap to hemline: 33”. You have added Leatherette Trim Pleated Chiffon Dress in Green into Wishlist. You have added Leatherette Trim Pleated Chiffon Dress in Green for Stock Notification. You have set Leatherette Trim Pleated Chiffon Dress in Green as a loved product. You have removed Leatherette Trim Pleated Chiffon Dress in Green as a loved product.